Not sure if you heard the latest Warning about Facebook. Facebook is coming after you (warning sarcasm alert ahead). 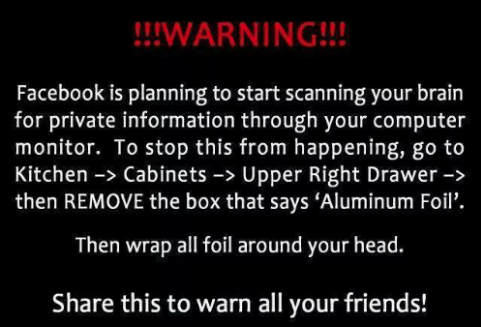 If you didn’t know what Facebook has planned, read this……. That’s right, you can expect a run on Aluminum Foil the next time you go shopping. Get ready to pay extremely high prices for foil, since they foil industry will need to protect over 1 billion people. Now that we have that cleared up, lets break down the hoax. – Better Safe than sorry is right. The first sentence in the hoax will always get you thinking. Oh no if I don’t do this I could be the only one to not do this. It plays on the readers emotions. -The violation of privacy can be punished by law (UCC 1-308- 1 1 308- 103 and the Rome Statute). And some specific legal speak to enforce in people’s minds that this could be legit. However, here is what the laws mentioned actually do. UCC 1-308- 1 1 308- 103 – Performance or Acceptance Under Reservation of Rights. (a) A party that with explicit reservation of rights performs or promises performance or assents to performance in a manner demanded or offered by the other party does not thereby prejudice the rights reserved. Such words as “without prejudice,” “under protest,” or the like are sufficient. (b) Subsection (a) does not apply to an accord and satisfaction. Rome Statute – The Rome Statute established four core international crimes: genocide, crimes against humanity, war crimes, and the crime of aggression. Those crimes “shall not be subject to any statute of limitations”. Under the Rome Statute, the ICC can only investigate and prosecute the four core international crimes in situations where states are “unable” or “unwilling” to do so themselves. Ok I admit that I have no clue what the UCC code does or what its supposed to do, but that doesn’t sound like some kind of rule that I (a normal human, non-commercial business) could use against a business. And as for the Rome Statute, as much as Facebook at times could be considered as “crimes against humanity”, I’m pretty sure this rule doesn’t actually fit either. – All members must post a note like this. If you prefer, you can copy and paste this version. 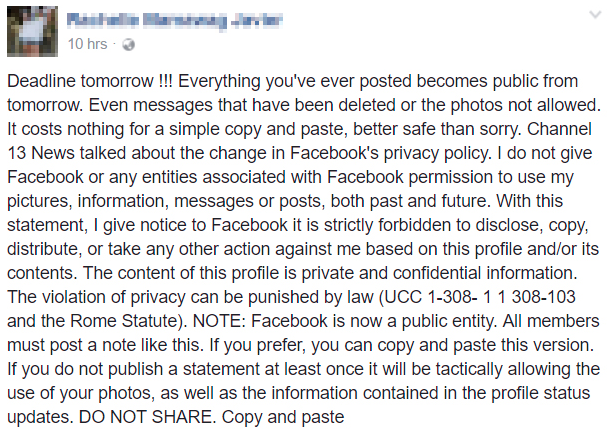 If you do not publish a statement atleast once it will be tactically allowing the use of your photos, as well as the information contained in the profile status updates. DO NOT SHARE. You MUST copy and paste [sic]. Wait members, what did I join. So my Sam’s club membership is worth something or is it my library membership??? Also note, I’m not supposed to “share this”, it only counts if I go through the trouble of cutting and pasting as a status message. So now that you have read this far, what do you think? Just remember one key thought the next time you come across one of these “post me now” kind of messages on any social media site. You should really do some research, to confirm its validity. Blindly posting messages like this only serve to propagate the “fake news cycle”. Pictures and words together DO NOT MAKE THEM TRUE! There are many ways that you can find out if something is true, before sharing it. Please help STOP CONTRIBUTING TO THE IGNORANCE (Insert PSA Music here). Lastly, if you still believe that Facebook could use your info as claimed in the post, please feel free to Google / Bing “Facebook privacy post hoax” and see how many reports from REAL News organizations you get.